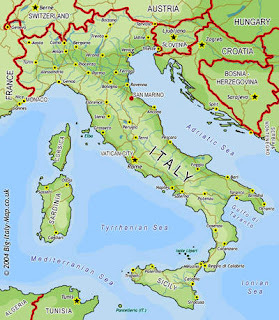 I want to go to Italy some day. I think most of us do. I get on kicks where I only want to watch Italian films. You should watch Malena, A Room with a View (set in Italy), Life is Beautiful, Il Postino, and Roman Holiday. Oh, and Only You is a fun one. 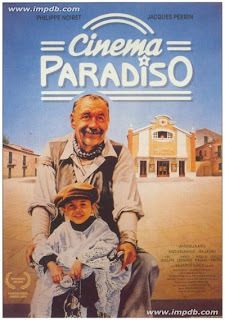 My favorite one is Cinema Paradiso. I love this movie. My point is, Olive Garden is having a contest where you can win a trip for two to Italy . I figure someone has to win so let it be one of us. I'm a dreamer but hey, you never know. Now if you'll let me boss you around a bit and organize your next movie night, I have a few suggestions. I think you should rent one of these movies, try your luck at winning a trip to Italy and make some of Dan's pasta (we found this recipe in Dominoe Magazine). Dan makes some dang good pasta. Cook a pound of fettuccine, and while that's going on simmer two cups of heavy cream in a big skillet. When cream is reduced by about a third, throw in the zest of two lemons, and a couple tablespoons of chopped fresh rosemary leaves. Cook a few more minutes, then transfer drained pasta to the skillet and toss with the sauce. Add salt, lots of fresh ground pepper and plenty of parmesan cheese, and serve. This pasta is our fancy pants meal for when we invite friends over. He doesn't make it for just little ol' me. SAD. I need to get to watching my movies! If I come to your house will Dan make us pasta? I think that would count as a special occasion. If you come over, I might even go in the kitchen to make the pasta. We'll let Dan do the decorating. That would be funny. You would most certainly get the pasta treatment. That sounds so good! Thanks for the movie tips. I love all things Italian! I had no idea you lie this movie - this is one of my very favorites too! Oh the kissing scene at the end with all the clips!!! I'm breaking that out and making Dan's Domino Pasta soon!